Mommy and me yoga is wonderful way to relax, exercise, and build community with other parents. Meldy's mommy and me yoga class combines yoga chants, song, and poses and is open to caregivers and kids ages 6months-3 years old. For the moms (dads and other caregivers), we strengthen the whole body with emphasis on the core, pelvic floor, and posture integrating our baby into the practice. It is a chance to bond with other caregivers, work on inner strength, and relax. The little ones have fun, interact, and develop their gross and fine motor abilities, language skills, and more! 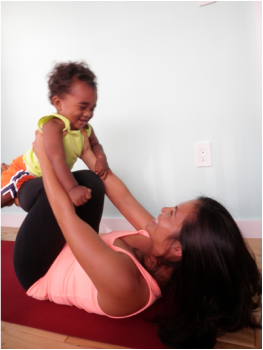 Meldy has a number of mommy and me yoga classes throughout Miami Beach.